Sam wears it in Unforgiven (6x13), when Dean returns to the motel with food, and Sam gets the call with the coordinates for Bristol, Rhode Island. In We Need to Talk about Kevin (8x01), Sam is wears this shirt from when they finally track down Kevin until the end of the episode. In A Little Slice of Kevin (8x07), Sam is wearing this shirt at the beginning of the episode when researching at Rufus’ cabin. In Everybody Hates Hitler (8x13), this is the shirt Sam is wearing when we join up with the Winchesters “2 weeks later” after they have discovered the Bunker, and Dean comes home from checking on Kevin, and Sam fills him in on the case he found while Dean was away. 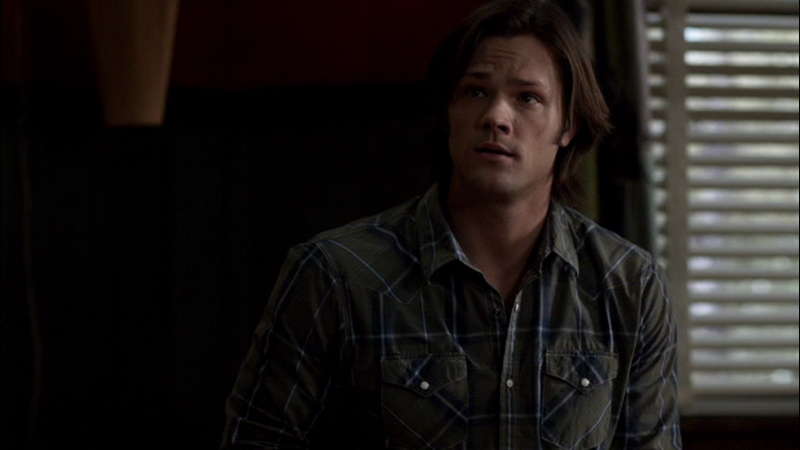 In Holy Terror (9x09), Sam’s body is wearing this shirt when Gadreel meets with Metatron for a second time. He changes out of it before Gadreel decides to join Metatron and receives the kill-order on Kevin. In King of the Damned (9x21), Sam has changed into this shirt when Crowley calls to tell Dean that he has found Abaddon and Sam and Dean leave Cas’ HQ to go kill her. In Black (10x01), Sam is wearing this shirt as he tortures the demon at the very beginning of the episode. In About a Boy (10x12), Sam wears this shirt at the end of the episode when he and Dean say goodbye to Tina at the bus station. In The Prisoner (10x22), Sam wears this shirt when he goes back to see Rowena and Cas and tell them what happened to Charlie after her funeral. In Love Hurts (11x13), Sam wears this shirt at the end of the episode when he and Dean pack up the motel room and Dean confesses his inability to kill Amara when in her presence. I own that shirt and it is green with blue and white plaid on it.